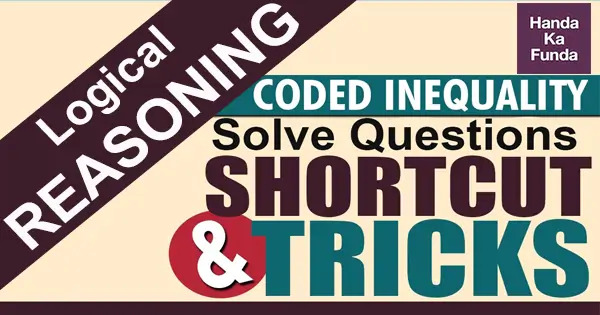 Coding inequalities: Inequality is a phenomenon that we have known or come across for a while now. It simply means something that is not equal in all the sense whether social, economical or mathematical sense. But today we are talking about Inequalities in mathematical terms. Each one of you has seen signs such as “>”, “≠”, “≤” etc. at some point of time or other. And all those who had math’s in their high school are thoroughly acquainted with the concept and comfortable in solving problems of Inequalities. So, for all those who have little or no idea about them, I will give you a brief introduction about this concept that will be sufficient to solve problems which is the essence of the discussion of this article. The above-mentioned properties also hold for strict inequalities. A δ B means A is small than B. Now on the basis of the statement given below be true, find which of the following conclusion holds to be true? If both 1 and 2 are true. If you carefully examine the above question you can find out that symbols are used to represent various inequalities and with the support of these inequalities conclusions are framed which defines a relationship between two variable and you have to judge whether these relationships are true or False. In summary, you have to decode the above coded inequalities and determine their validity. These kinds of questions come in various competitive exams such as Bank PO, SSC, CAT etc. These questions can prove to be effortless and simple to solve if you now the right technique and methods to do so otherwise, they can be perplexing and time-consuming. In this blog, I will provide you straightforward and direct methods and steps on how to approach these types of problems and solve them rapidly. Step 1: Accurately decipher: You should make sure you correctly and carefully write the meaning of the code either along with it or can make a separate table for it. To avoid mistakes, make sure that you take one code at a time and replace it with it’s original meaning everywhere then move on to the next one. For example, E γ F means E is equal to F. Thus, replace γ with = everywhere in the statement and conclusions wherever the code exists. Hence above statements are “relevant statements” for the given conclusion. Step 3: Combine the relevant statements and develop the conclusion from it. Now, how to combine the statements? There are 3 golden rules to do so. Rule 2: The common term must be less than (or equal) to one term and greater than (or equal to) the other term. Rule 3: The conclusion inequality is obtained by letting the common term disappear and it has a ‘≥’ or ‘≤’ sign if and only if both inequalities in the second step had a ‘≥’ or a ‘≤’ sign. In all other cases, there will be a ‘>’ or ‘<’ sign in the conclusion. When you are done with all these above steps and the conclusion is established and verified; well and good. If not, then follow these additional checks. Check 1: Examine if the given conclusion directly follows from any one single statement. Check 2: Analyze if the conclusion inequality you reach is essentially the same as the given conclusion but written differently. Check 3: If your derived conclusion (or given a statement) is of type A ≥ B (or A ≤ B) then check if the two conclusions are A > B or A = B (or, A < B and A = B). If yes, choice “either follows” is true. Check 4: If neither of the conclusion has been proved correct till now, check if the given conclusions form a complementary pair. They form a complementary pair in the following 4 cases. Note 2: Check 3 and check 4 are required only if both conclusions have the same pair of terms. Note 3: Two terms can never be equal if in the original statements these two terms won’t appear in separate equalities. It means that P = Q may hold only if there are two statements such as P = R. Q = S present in the problem. Otherwise, if no such statement is there in the question then it is definitely false. Therefore, with the help of above steps, we can straightaway solve the problem quoted earlier. Step 3: Combining the above two statements by using the three golden rules we get, E = F ≥ G i.e. E ≥ G which doesn’t satisfy the given conclusion. Thus, conclusion 1 doesn’t hold. Let’s perform both these two steps for conclusion 2. Step 2: Relevant statements for conclusion 2 are C < D and D > E.
Step 3: We cannot combine inequalities here as D is greater than both C and E. Check 3 and 4 are futile here because of Note 2. Also, check 1 and check 2 cannot prove anything concrete and doesn’t bring any solution. Thus, conclusion 2 is also invalid. Therefore, the correct answer to the question is neither of the conclusion is true. I believe the above method would make solving similar questions easily and smoothly. Though, you will get more clarity on how to use the above checks precisely with time and practice.